Looking for your own special custom stamp? We can make any type of custom stamp for you! 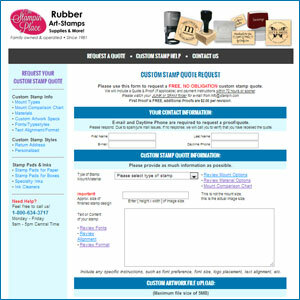 Your Custom Artwork files - create your own art-stamp designs! Personalized Stamps: created by, handmade by & more! We can let you know if we can make it. You will be asked for the following information to receive a quote: Type of stamp mount (wood, handle, self-inking or pre-ink) and material (rubber or polymer), the size or area to fit, and the text or content of your order. You may also upload custom image files. or you can reach us by telephone at 800-634-3717 or 763-263-6646.